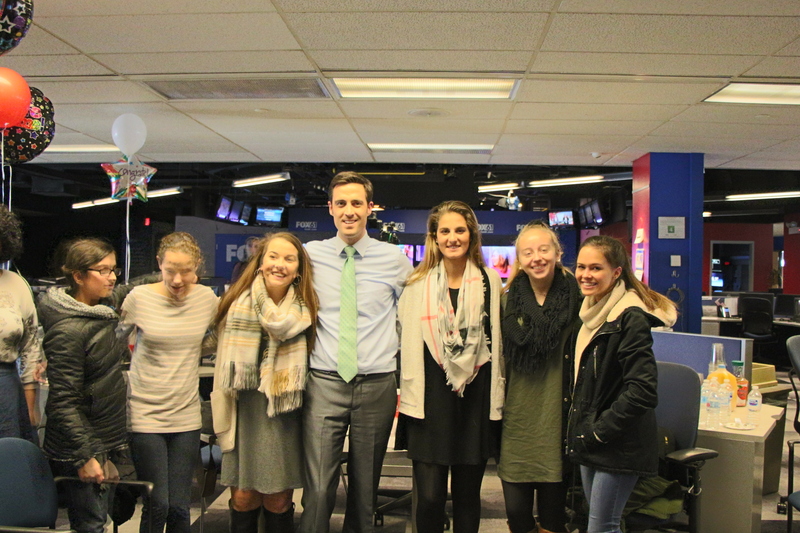 On Friday, December 1, 2017, Journalism Teacher Leslie Chausse went with her class to Hartford at The Fox News Studio. 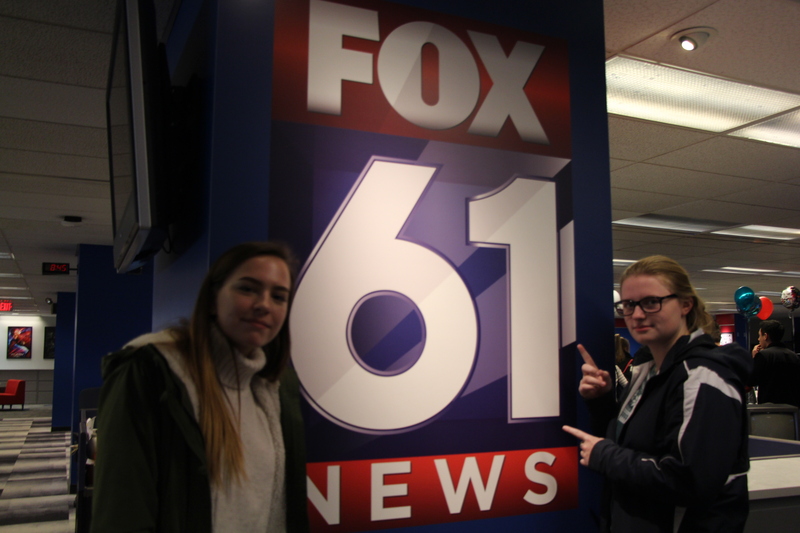 Sophomore Jillian Crowley and Senior Abbigale Pitarra made a video to submit to Fox 61 Student News. After submitting the video, Mrs. Chausse got an email from Chief Editor of Fox61 Daniel Putnam inviting the students to come for a launch party to congratulate the hard work. Jillian and Abbigale were aired live on Fox News along with Commissioner of Education Diana Wentzel. Fox News 61 aired their video on the Kindness Revolution with the live interview. They invited not only Jillian and Abby but the whole entire class to celebrate the Fox61 Student News program. Superintendent Maryann O’Donnell and Principal Keri Hagness also came along to capture the special moment. Where the students and adults were invited to be involved in Fox News morning meeting and be able to have breakfast. about his job, and we all loved talking to him.” After waiting for 15 minutes, Daniel came and got Jillian, Abby and Diana Wentzel. While they were waiting to go on air, the girls talked to Executive Producer Liz Berry. “She was very welcoming and made Jillian and me a little less nervous to go on the news. She told us what was going to be happening and the idea of what we would be asked,” said Abbigale Pitarra. Jillian claimed, ” I was full of excitement but slightly nervous. But overall it was such a fun experience with Abby.” Erika Arias was interviewing them and was very polite and made the girls feel less nervous than they were walking in. “Waiting for my fellow classmates on the live news was a very cool experience,” claimed Senior Romulo Vicuna. After the girls were all done with the interviews, the class was invited back to the newsroom where there were balloons congratulating the students and food and drinks. President of Big Y World Class Market Charlie D’Amour, whose company sponsors the Fox61 Student News program, also stopped by to congratulate the class. Fox61 News personnel invited the students to the morning editorial meeting. At the morning meeting, the Fox61 news journalists discuss what they are going to report on for the day’s newscasts and which reporter is going to cover the stories. While we were at the morning meeting, Jeevan Vittal interviewed a couple of the students for the 5 o’clock news. He interviewed Sophmore Olivia McCray and Sydney Church about how their day was and how they felt about the student news. Senior Taylor Marnett and Abbigale Pitarra were also interviewed about the high cost of college. Mr. Putnam interviewed Mrs.Chausse about how the Fox61 Student News Program benefits her students. Students also got a tour of the studio. Meteorologist Dan Amarante let us use his clicker to change the green screen as if we were on the news. Sydney and Olivia filmed Jillian and Abby with their OTD as well as Keith McGilvery. After the fun and successful day at Fox News, the class went to the State House Food Court to enjoy food as a reward for all of the hard work of Jillian, Abby, and the class. Watch the films below of the interviews.